The new RCA graduates with their professors and Rabbi Israel Lau. 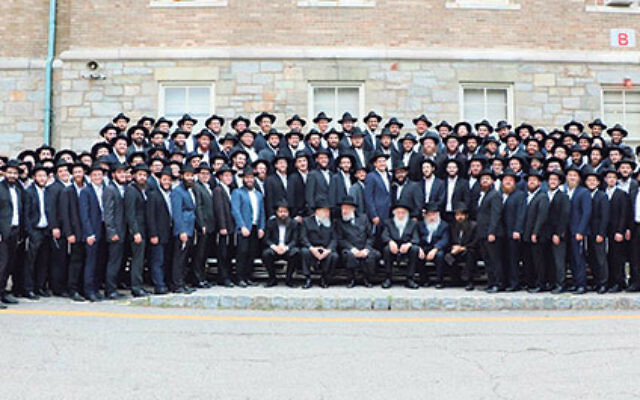 This year, a diverse group of 257 students received ordination at the Rabbinical College of America. Close to 700 guests from eight countries and 10 states attended the graduation ceremony on June 26 at the Morristown campus. The event was presided over by Rabbi Israel Lau, former chief rabbi of Israel, who came to New Jersey especially to test the new rabbis and sign their certificates. The graduates represent dozens of Jewish communities and include native speakers of English, Hebrew, Portuguese, Spanish, Russian, French, German, Italian, and Swedish. Rabbi Moshe Herson, RCA dean and president, said the new rabbis “are ready and able to serve virtually every Jewish community in the world,” a signature accomplishment of the worldwide Lubavitch movement, which the RCA represents. During the event, RCA trustee Ed Mosberg of Parsippany presented to the college a 200-year-old Torah scroll rescued from the Holocaust.